The sacrifice of God is a broken spirit: a broken and contrite heart He will not despise. without money and without price. Why do you spend your money for that which is not bread, and your labour for that which does not satisfy? Listen carefully to me, and eat what is good, and delight yourselves in rich food. Incline your ear, and come to me; listen, so that you may live. The Old Testament reading is from the book of Isaiah. We’re told in chapter 6 that Isaiah was called to his prophetic ministry around 740 BC in the last years of King Uzziah’s reign. In the first 39 chapters of the book, which covers a period when Judah and Jerusalem are under the monarchy, Isaiah speaks out against the unfaithfulness of Israel and Judah and declares that, as a result of their infidelity, lack of faith, and plain unbelief, their judgement and fall will come at the hands of the Assyrians. In the second section of the book chapters 40 – 55, almost certainly dating from a later period during the exile in Babylon and from where our reading comes from today, Jerusalem has indeed been taken and its people are in captivity. Chapter 40 of Isaiah opens with the familiar words, ‘Console my people, console them’, which is often translated in our more modern versions of the bible as ‘Comfort, comfort my people’. It’s because of the opening words of this section that it’s sometimes known as the Book of Comfort or the Book of the Consolation of Israel. And whilst the first 39 chapters warn of the judgement to come, the next 15 give a message of comfort after judgement has happened. And, however impossible it once seemed, a new exodus is about to bring the people home to the Promised Land from where they are in exile. Cyrus, the king of Babylon, has decreed that the Israelites can return. This middle section of Isaiah covers a watershed time between ‘the things of the past’, and ‘the things of the future’. God the creator and saviour is seen to be dramatically intervening in history as His people are restored to the holy city and are extravagantly invited to participate in the benefits of the new covenant. Chapter 55 of Isaiah from where today’s reading comes is the end of this watershed period. Chapters 56 – 66 which follow then take us forward again, this time to Jerusalem after the exile and the time of the restoration. Today’s reading from Isaiah reminds us that all are invited to the banquet the Lord offers. There are no preconditions, there is no catch. All are called to seek the Lord and accept His invitation. To depend on Him for His abundant provision rather than on meagre human efforts and offerings. This is the message Paul has for the Corinthians, ‘…So, if you think you are standing firm, be careful that you don't fall!...’ Paul is saying that the Corinthians are not to think that baptism and the Eucharist will supernaturally save them without them living lives that are honouring to God. For Paul baptism and the Eucharist are not empty signs and symbols and they certainly do not exempt anyone from their moral and spiritual obligations and responsibilities. The Corinthians, who in some sense seem to be idolising the rites of baptism and the Eucharist and perhaps becoming complacent, should not take baptism and the Eucharist for granted, to think that they are so secure they no longer need to bother with continuing with a life of repentance and turning to God. Taking the law for granted was one of the traps that the Israelites seem to have fallen into. As Isaiah reminds us, God’s ways are not our ways and continuing to turn to God is a lifetime commitment and journey if we are to receive the fullness of His mercy. We can take nothing for granted. Whilst there will always be tempting shortcuts to instant gratification, these are seldom of God. Why would we waste time and effort on these asks Isaiah. The somewhat strange passage from Luke holds Isaiah and Paul’s appeal to the Corinthians together as it speaks about both the repentance outlined by Paul and the mercy emphasised by Isaiah. We have to repent and return if we are to receive God’s mercy. Even the fig tree is offered mercy and given a second chance! Jesus Himself has come to Israel to look for fruit but has found none. Israel is a nation dancing with disaster. He’s offering one last chance; the example and way of Christ which changes both our individual lives and our common life together, but there is a sense of urgency. People need to change their lives to conform to the will of God, no longer going their own ways of self-satisfaction and gratification. It’s an invitation not just to understand the negative consequences of selfishness and evil but to see the positive outcomes of a life given over to God. We have a responsibility to repent and turn to Christ, but more than this, we are encouraged to grow and bear fruit through our actions. We can’t do one without the other. Indeed, our constant turning to God, through His son Jesus is a pre-requisite to our growth, obedience and discipleship. And Luke highlights that we’re all in the same boat, we are all in need of this constant turning to God. There are no sinners greater or lesser than others. In His words, Jesus points out that victims of disasters or violence are not greater sinners than others. We are all caught up in a fallen world, ‘…the changes and chances of moral life’ as the Book of Common Prayer so succinctly puts it. Ultimately death will come to us all and we should not be tempted to draw the wrong conclusions from natural events or atrocities precipitated and ordered by humans. But, echoing the words of Paul, we can’t live indefinitely in a way which is not pleasing to God without understanding and bearing the consequences. f it is well cultivated and nourished it will produce fruit, but if it is neglected, it will wither and die." In the reading from Matthew today there are two clear parts. In the first part Jesus is told about Galilean worshippers who had been killed by Pilate. The blood thirsty scene is described by the words that their blood had been mixed with the blood of their sacrifices. It is a gruesome story and one which would have caused the people to think that in some way God was judging these poor folks and punishing them in this cruel manner of death. That was the way that people thought, and some people still do ! In parts of the Old Testament the message is given that if you behave yourself, and if Israel behaves itself, then all will be well. Good things happen if you are good, and bad things happen if you are naughty. If only it was so simple. Thankfully Jesus is forthright and explicit in saying that this was not the case, they were no worse than anybody else. Jesus reminds the people of another incident in which 18 people had been killed when a tower in Siloam fell on them. This is the kind of incident which we still read about all the time. A corrupt construction company builds a tower block and uses faulty concrete and the whole building falls down and kills people. The idea that the innocent folks who were in the building were judged by God in absurd, if anybody should be judged it would be the builder ! These are cases of being in the wrong place at the wrong time and Jesus is eager to make that point. Events like this should remind us of the uncertainty and frailty of human life, they should not cause us to jump to judgement on the poor people who suffer. Jesus uses the episode to remind his hearers that life is precarious and as such we must all be ready for a time when life comes to an end and we are faced with judgement. Instead of being self righteous when we witness the unfortunate death of others, we should learn from such things the importance of putting our own house in order, whilst there is still time. Last week we heard the story of Jesus and his lament over Jerusalem. In the second part of our reading this week, we read another story in which Jesus shows his remorse over Jerusalem. 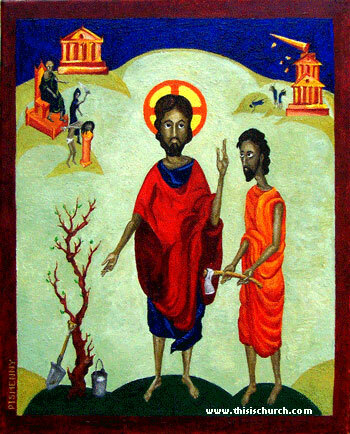 Jesus uses the illustration of a fig tree. Figs and fig trees are used several times in connection with Israel (Hos 9:10, Jer 24:1-10, Mic 7:1) Fig trees and vines were mentioned together (Ps 105:33, Jer 8:13, Joel 1:7). They were associated with peace and prosperity and their absence was a curse and a punishment (2 Kings 18:31, Num 20:5, Deut 8:8). The symbol of sitting under your own vine and fig tree was a symbol of the messianic age. However unproductive plants were frequent symbols of unfaithfulness (Is 5:1-7, Jer 8:13, Hos 9:16) and destruction of figs and vines is a metaphor for judgement (Jer 29:17, Ez 17:9, Amos 4:9). The fig tree in the parable today is planted in the vineyard and it should be a cause of blessing and joy. However it has been barren for years and the owner tells the gardener to cut it down. The gardener appeals for clemency, a stay of execution for a year during which time it will be given special treatment to make it fertile. There is a reminder here of the words of John the Baptist, who had told that the axe of judgement was ready to fall. However here Jesus speaks of leniency, there will be a suspension of the sentence. It is like Abraham interceding for Sodom, mercy being proclaimed on the edge of judgement. It is difficult not to see the words of Jesus as a proclamation that Israel was living on borrowed time. Israel should have been a fruitful fig tree, a blessing to all, instead it was found barren. There was to be a judgement, however there would be a delay to ensure that every effort had been made to make her fertile again. Is God meant to be the owner and Jesus the gardener? Or is Jesus the owner, warning Jerusalem of her fate as he approaches? We will never know and we can only guess. The reality was that Jerusalem discovered judgement and destruction very soon afterwards. However, the words of Jesus are not just a warning to Israel and Jerusalem, they are a warning to us all that we should live productive lives. Our actions are important and have consequences. If we are barren in our good works, devoid of kindness and mercy, self righteous and self absorbed, then we will stand condemned. The chilling nature of the parable is reinforced by the context of those words of Jesus at the start of our reading, ‘unless you repent, you too will all perish’. This is the season of Lent, the season for repentance, now is the perfect time to seek God’s strength to live fruitful lives. GUS and TOM. The names stand for Give up Something and Take on More. We might want to do this during the special season of Lent and think what good it might be to ourselves and others. It is now quite standard for someone to give up something they love for the duration of Lent. While I am lost in admiration at anyone who will deprive themselves of chocolate for six weeks, I have to ask who is this benefiting? If you give up chocolate to lose weights then it only helps you. If you give up drink to get healthier and save money, then again it is a very self-centred achievement. If you chose to give the money saved away, then that might be of more use. On the whole I think I like TOM better! Take Up Something this Lent which will make someone else happier – perhaps a charitable activity or giving a few extra minutes to someone who needs you. A good idea is a time audit: looking at our lives to see if we are really spending them the way we should or could. Perhaps this Lenten decision could replace some other, less useful activity? This week’s readings, and many of the readings leading up to Easter, focus on the theme of repentance. In the gospel reading, the owner of a fruitless fig tree wants it destroyed, but the vinedresser asks for more time to cultivate it so that perhaps it will bear fruit. If it does not then it can be cut down. We never hear what happened. Did the tree bear fruit or not? We don’t know - but it was given time by a gracious owner. What would the believers think every time they looked at the tree? Perhaps each time they walked by they would be reminded of Jesus’ words to repent and to turn back to God. The God to whom we turn and return (the root meaning of the word repentance) is that same God. He is the God of the past, and the God of the future. The God of our past, and the God of our future. When we do repent and turn to Him, it’s not so much a case of our finding God, but more a case of being open to be found by Him. And because He finds us, what may have appeared to be a fruitless past need not produce a barren future. In today’s world it sometimes seems that turning to God and spending time with Him on a regular basis is at odds with being fruitful. There seems to be little enough time to do all that we want to do anyway, without trying to find time to fit even more things in. And yet, it’s a paradox of the gospel that it’s precisely by taking time out and spending time turning back to God that we are able to be more fruitful. As we open more of ourselves up to God, so He can pour more of Himself into us and we bear fruit, perhaps not in the way the world would see, but then, God’s economy never was the same as that of the world. For some of us, taking the time to stop and wait on God requires a discipline that we find hard. There always seems to be something else to do, even if it’s just watching the TV or reading a book. For others, this discipline may be a question of getting priorities in the right order. One of the things Lent offers us is a time to reflect on our priorities and the discipline (or lack of it!) we have in our relationships with each other and with God. Are we serious and diligent about developing our relationship with God as we turn and return to Him day by day? Where do our priorities really lie? This is the theme which is picked up in our readings from Isaiah. An invitation to the hungry and thirsty to come to eat and drink from the richest fare that God has to offer and to labour on the things which really do satisfy. To get our priorities aligned to those of God. To walk in His way and receive His blessings. For if the first paradox of this weeks readings is that by spending more time with God and walking in His ways we become more fruitful, the second is surely that as we become more fruitful so we receive even more of the riches and blessings God has in store for us. Sometimes it’s difficult to understand what God is doing in the world. The world, it seems, is far from walking in God’s ways, working to His priorities or being fruitful in God’s economy. More often it appears like we are wasting the world’s resources and working to our own agendas, or to those of people in positions of supposed power and authority. The world’s ways are not always God’s ways. But His desire for us remains the same; to be fruitful, now and in the future; whatever may have happened in the past. As Christians, as people who are continually turning to God we open ourselves to His cultivation and encouragement to grow and develop. In so doing we have the sure hope that after the austerity and apparent barrenness of a Lenten time comes the fruitful bounty of Easter. When something bad happens who is to blame? If a baby child dies of cancer, or a family drown in a boating accident, is this God punishing them? Jesus is asked just this kind of question in our reading today. Jesus is clear, such disasters are not targeted at individuals. God does not have a heavenly lottery to call your number, neither does he point the fickle finger of fate at us. We are not zapped by God if we do something wrong. However having made that clear Jesus does not waste the opportunity of this question to challenge those who had the cheek to ask it. He tells them to amend their own lives not to point the finger at others. In AD 70 a terrible thing happened, the Jewish Temple was destroyed and the Jewish people were massacred by the Romans. This was a punishment for their rebellion, those who lived by the sword were, as Jesus forecast, to die by the sword. Throughout his life Jesus encouraged people to adopt a different life of peace. Jesus warns people in the passage today to change their ways or destruction will surely come. Jesus is not referring to some punishment beyond the grave, he is stating the obvious to his his questioners that they should bear fruit now or suffer the consequences of their own decisions. The result of their refusal to follow the way of Jesus brought destruction and the magnificent temple stones were raised to the ground and many lost their lives. Pontius Pilate was an unpopular Governor of Judea. Josephus the Jewish historian tells us how he spent the Temple tax to build an aqueduct and brutally crushed the following rebellion. When some pilgrims from Galilee had been offering sacrifices at the Temple Pilate sent troops in and had them massacred. So questions come to mind. Is the death of these pilgrims a sign of the punishment that Jesus is speaking about? Is Jesus frightened? Will he still take his Galileans on to Jerusalem? God of all consolation and comfort, bring to us at this time of trial a knowledge of your presence in the face of fear, darkness and death. We ask for your comfort to be with those who grieve, that they might find the courage to bear their pain of their most bitter loss. We pray for all victims still in hospital and for those who care for them. We bring you our grief and ask for courage to bear it. We bring you our thank for all you give us, in those we love. We bring you our prayers for peace. God our creator and our end, give us the courage to welcome that unimaginable moment awaiting us all; give us trust and confidence; and at the last give us peace.